The Chinese-funded Magam Ruhunupura Mahinda Rajapaksa Port (MRMRP) in Hambantota has recorded revenue of Rs.5.39 billion for the year 2014, compared to Rs.585.2 million in 2013, statistics released by Sri Lanka Ports Authority showed (SLPA). The bulk of the revenue— Rs.4.26 billion— has come from bunkering operations that began June this year, with a US $ 76.5 million bunkering terminal. The port received 134 vessels calling for bunkers up to December for a total volume of 53,487 metric tonnes.According to the SLPA, replenishment of stocks are ongoing with major suppliers getting actively involved in the supply chain ensuring timely supplies and quality of the products. “MRMRP is fast becoming a major stopover for vessels to stem bunkers with its brand new tank farm and terminal complex in full operation. The main customers are the very large bulk carriers and Crude Oil tankers which are plying the busy sea lanes in the region,” SLPAsaid in a statement. The tank farm with 8 tanks for fuel bunkering facilities for vessels, 3 tanks for aero fuel and 3 tanks for storing LP gas can initially handle 55,000 tonnes of shipping fuel and is expected to add another 100,000 tonnes under the second phase.Meanwhile, revenue from vehicle handling for the year 2014 stood at Rs.1.12 billion. 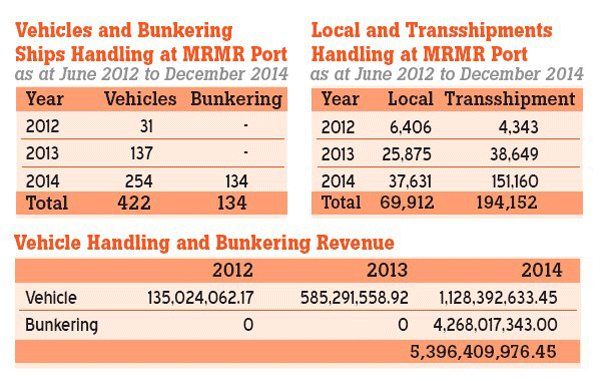 The port handled 254 vessels carrying vehicles (Ro-Ro vessels) against 137 Ro-Ro vessels in 2013. The total number of motor vehicles handled this year was 188,791 against 64,524 units in 2013, SLPAsaid.As a measure to ease the long berthing delays experienced by Ro-Ro vessels in Colombo, SLPA has been routing such vessels to MRMRP from June, 2012.Meanwhile, MRMRP has handled 37,631 domestic and 151,160 transshipment units in RO-RO operations this year, against last year’s 25, 875 and 38, 649 units, respectively. SLPA said, 70 percent of the second phase of MRMRP has been completed by now and will be ready for operations during the final quarter of 2015. The phase one of MRMRP is estimated to cost US $ 361 million, excluding bunkering terminal, while phase two is priced at an estimated US $ 808 million. The ‘Agreement on Key Terms for Supply, Operate and Transfer (SOT) of Container Terminal Hambantota Port Development Project Phase II’ was entered into this September in the presence of President Mahinda Rajapaksa and his Chinese counterpart Xi Jinping. Dr Wickrama signed on behalf of Sri Lanka. Signing for China were representatives of China Merchants Holdings International (CMHI) and China Communication Construction Company Ltd. (CCCC). The former already operates the new Colombo International Container Terminal (CICT) and the latter is building the 233-hectare Colombo Port City. The partners in the Hambantota SOT will be CMHI and China Harbour Engineering Company Ltd, an engineering contractor and subsidiary of CCCC. According to a filing made by CMHI to the Hong Kong Stock Exchange, it will hold 64.98 percent of the project company while SLPA will have the remaining 35.02 percent.“The concession period to be granted to the project company under the SOT agreement shall initially be 35 years from the commencement of operation of the SOT project, which can be extended by five years at the option of the project company,” CMHI said in the filing.